Mizuno Wave Mujin 2 are neutral trail running shoes. 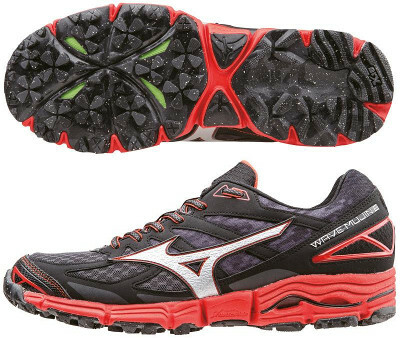 The Mizuno Wave Mujin 2 updates the most robust and protected trail running shoe from the japanese brand with more support and improved water repellent upper. Ready for long runs through mountains, the Wave Mujin 2 provides enough protection even in stony goat paths with the EVA based forefoot plate rock. As well as its smaller siblings the Wave Hayate 2 and Wave Kazan 2, the Wave Mujin 2 replaces the underperforming on uneven terrains U4iC foam with tested and durable AP+ and features a brand new upper. This new upper improves breathability with an open mesh in the front side and stitched strips provide better fit and improved endurance against external rubbing. The Wave Mujin 2 keeps some elements that worked fine in its predecessor the Wave Mujin. Outsole design and materials didn't change at all with bidirectional rubber for great grip on wet surfaces and durable X-10 carbon rubber on most exposed wear areas for heel strikers. Besides the AP+ foam in the midsole mentioned above, cushioning relies on the well known concave Wave for smooth ride. Midfoot's X groove allows better uneven ground adaptation with enhanced flexibility.